In this post: A short dive into the 1800’s. 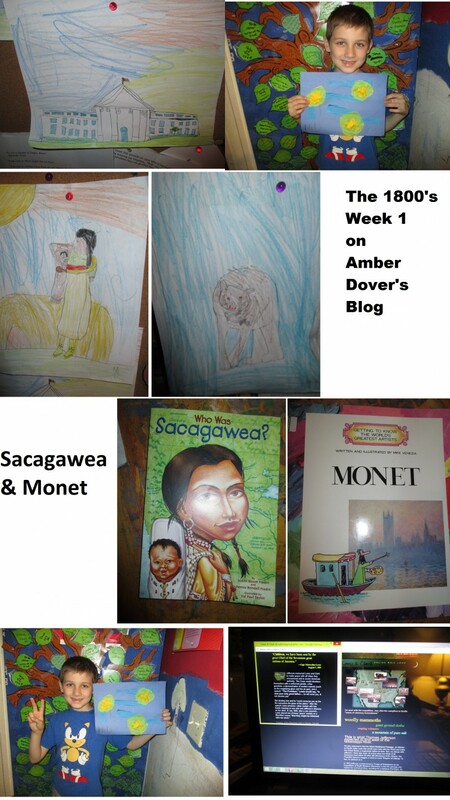 Here’s week 1 as we study Lewis and Clark, Sacagawea and Claude Monet. Hello dear ones! This is a super short post but I didn’t want you to think I was skipping the first week of the 1800’s. We were so laid back this week. I’m thankful to finally be in the 1800’s though. I’m almost caught up on posts. We read about Lewis and Clark and their westward journey in Story of the World Book 3. We also learned about Napoleon, the Haitian revolt, and the rise of factories. Michael read “Who was Sacagawea?” and started reading “Farm Boy”. Michael drew Sacagawea, a grizzly bear, and the White House from his Draw Through History book. Michael read about Claude Monet and then he made a 3D lily pads in a pond picture inspired by Monet. Michael played an interactive Louis and Clark game.